Random And Some: "I learn by going where I have to go"
After tearing through And Quiet Flows The Don, I also read Kurt Vonneguts semi-autobiographical Slaughterhouse Five during my recent vacation in Turkey. I was introduced to the book via John Green's Paper Towns, and it has been on my Book Bucket List ever since. Slaughterhouse Five was published in 1969. Optometrist slash widower Billy Pilgrim was a pacifist soldier during World War 2. He managed to survive the controversial bombing of Dresden, but it has tremendously affected his post-war live. At regular intervals, Billy travels in time. Vonnegut, who was a POW himself, recurs as a minor character in the book. 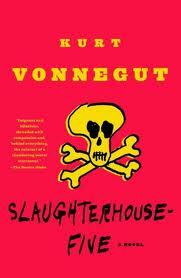 Vonnegut's writing is sarcastic and witty, and the plot is trippy, but addictive. Slaughterhouse Five explores the concept of fatalism on the one hand, and has Tralfmadorian aliens on the other hand. I can't figure out for the life of me if I hate this book or love it.